I had an appointment with Dr. Fowler this morning and could not have been more pleased with her and her staff. The courtesy and professionalism could be seen in each person from Jade at the front desk to Dr. Fowler during the exam. Dr. Fowler was very thorough and informed me about each test she performed and what perspective it gave her on my overall eye health. I was very appreciative of her knowledge and ability to explain, in simple terms, the answers to the questions I asked. My family and I will definitely return to Hazel Family Eyecare and I would recommend them to anyone! Dr. Fowler is such a wonderful eye doctor with all the latest and greatest in technology to care for your eyes. She truly cares about taking care of your eyes for the long term. Liz, the optician, is so sweet and patient and helped me pick out the cutest pair of glasses, they have the best variety to choose from and they fitted my glasses with the m'eye fit and took pictures to help me choose a pair, so neat!!! You'll leave a happy camper!! I've been a patient of Dr. Fowler's for several years and now bring my daughter to see her as well. She is the best in the business and truly takes a collaborative approach when working with her patients. Her new practice, Hazel Family Eyecare, is beautiful and relaxing and her team is warm and very knowledgeable. They have all of the latest technology in eye care - offering state-of-the-art care for their patients. They carry an extensive selection of top-of-the-line glasses frames at an affordable price. They have the biggest and most stylish selection of children's frames in the Metro Atlanta area. 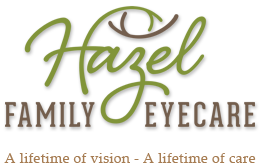 I highly recommend Hazel Family Eyecare to all of my family, friends and anyone looking for the best eye care in Atlanta! I had a great experience during my visit to Hazel Family Eyecare. Dr. Fowler is highly skilled and was very professional, friendly, and accommodating. I felt very comfortable the entire time and well informed on the health of my eyes and the current status of my vision. I was easily able to order new contacts and received personal attention when picking out new frames from the great selection they had. I would highly recommend anyone to Hazel Family Eyecare for any of their vision needs!